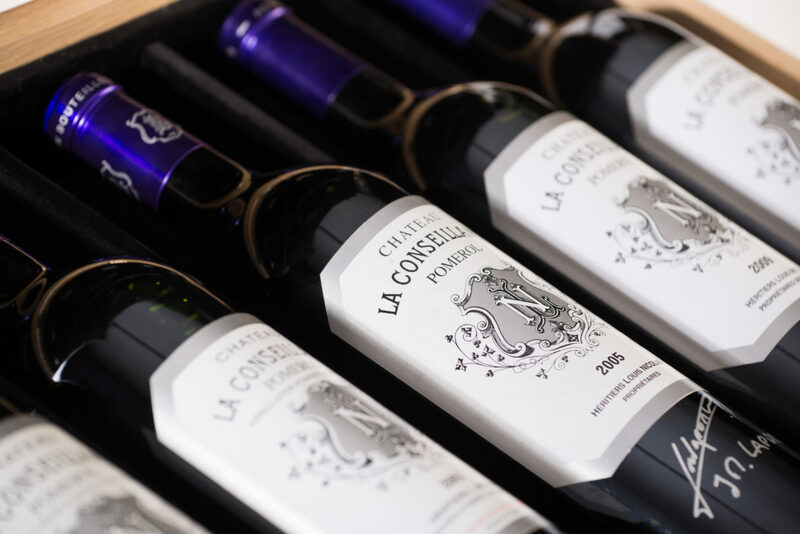 In the autumn of 2013, Wealth Solutions presented a special Bordeaux wine collection made up of the best Chateau La Conseillante vintages. Wine from this collection was selected by the winery manager, Jean-Michel Laporte. Additionally, each bottle was signed by the Château director and winemaker. This unique wine collection was a limited to only 30 cases. 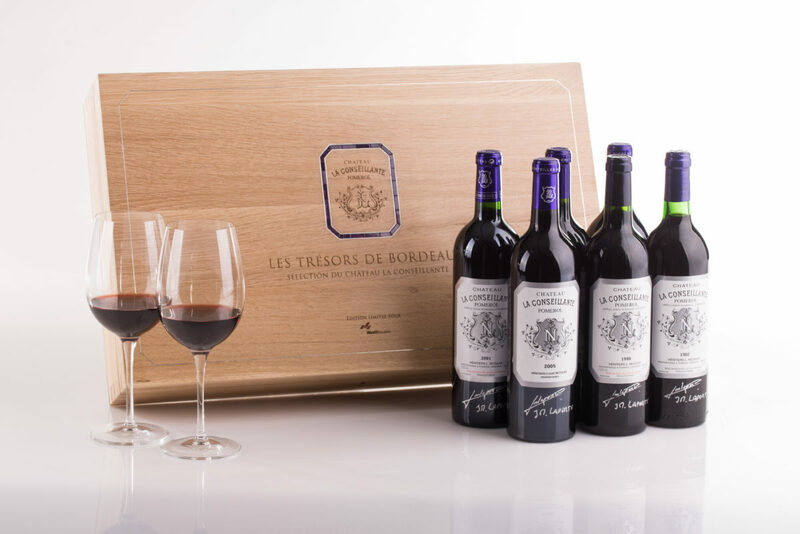 Exclusive, limited edition of 30 numbered sets of six best vintages, specially selected by the Château director and winemaker. Bottles are signed by the Château director and winemaker. Packaging of the highest level, perfect for collectors. The last few bottles of the legendary 1982 kept in the château cellar. 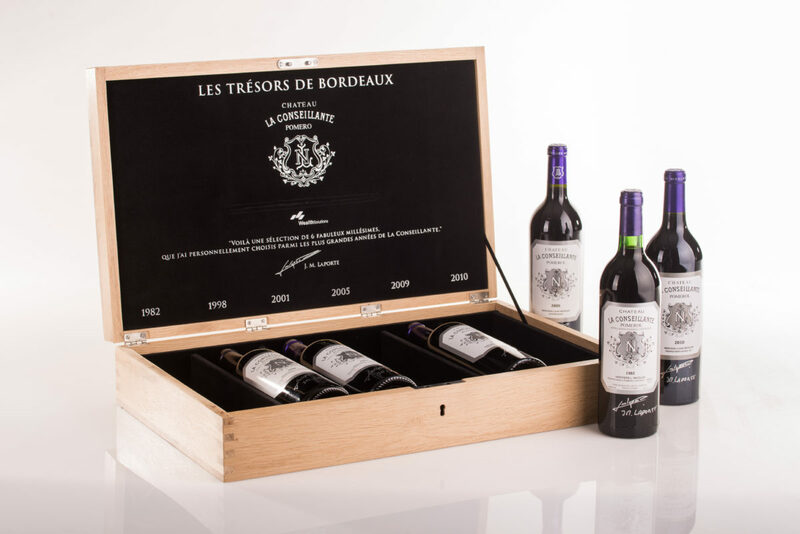 In the autumn of 2013, Wealth Solutions presented a special Bordeaux wine collection made up of the best Chateau La Conseillante vintages. Wine from this collection was selected by the winery manager, Jean-Michel Laporte. Additionally, each bottle was signed by the Château director and winemaker. This unique wine collection was a limited to only 30 cases. All bottles from the collection were “ex-chateau”, some of them the last remaining bottles of the excellent 1982 kept in the winery. The entire collection was given special collector packaging. It consisted of the commemorative booklet and hand-made Polish oak case. The cover of the case was decorated with an amethyst jewel set in silver: amethyst is purple, which also happens to be the signature colour of Chateau La Conseillante. The casing of the collection is exceptional. The case is made of the highest-quality Polish oak. Its lid is ornamented with a unique jewel composed of amethysts set in silver. The stone was not chosen at random; it is violet, the colour of Château La Conseillante. It is also a stone which, according to the ancient Greeks, protects people from the harmful effects of excessive alcohol consumption. La Conseillante has all we have learnt to appreciate in Bordeaux – rich traditions, unique natural conditions and the highest quality wine. It is one of the oldest and the most remarkable châteaux in the Pomerol commune. Undoubtedly the success of the brand comes from the favourable climate and fertile soil, which is perfect for merlot and cabernet franc wine grapes. These conditions, together with a centuries-long tradition and experience, make this place a home for a unique wine that is complex and deep as well as fresh and brisk. The robe is intense with reddish-brown tinges. The violet, spicy nose has outstanding aromatic variety and richness. The palate bears witness to all the secrets of the terroir: it combines refined tannins with a robust body and great nobility. A great bottle. The already slightly aged plum-garnet robe heralds an intoxicating, sensuous nose of raspberry, spices and vanilla. The outstanding palate unveils with elegance and finesse its velvety texture, with pepper, sweet almond and raspberry notes. Bright, garnet robe. Wonderfully complex, the nose sports cherry, violet and animal notes. The attack on the palate is smooth and fruity, but then elegant tannins take over to make it bigger. The finish is mellow, concluding with the first notes of evolution, such as leather. 100% new french oak barrels (reserved to the exceptional vintages) permitted to integrate this tannic power, and to reveal all its aromas. Conseillante 2009 has the particularity to taste outstandingly since its first moments. The characteristic of this vintage lies in the silkiness and the very premature integration of the tannins and by their perception on the palate. Very powerful, the latter presents nevertheless no dryness or astringency, and makes the wine unspittable. If we add the important aromatic expression, which mixes black fruits, violet, liquorice and fresh almond, we obtain a wine of a magnificent balance and an exceptional length seen its young age. The 2010 vintage has just concluded a superb trilogy 2008-09-10, which is reminiscent of 1988-89-90. It will delight purists by its power and superb balance, in the perfect Bordeaux style. Denser than 2009, it presents above all a stronger acidity, which will give him an important ability to age. In this sense, it is closer to the 1989 vintage. Complex, mature and extremely deep, it promises to be one of the best ever vinified Conseillante. Les tresors de Bordeaux to owoc naszej współpracy z Château La Conseillante, który w znakomity sposób oddaje styl produkcji wielkich win z Pomerol. 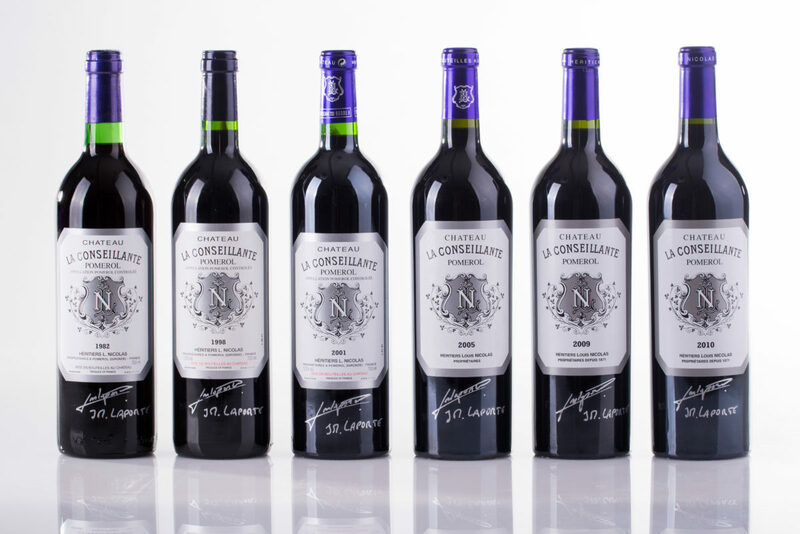 Here is the selection of 6 fabulous vintages, which I have personally chosen from the greatest years of Conseillante.